With the announcement of Epona as a new weapon in Link’s arsenal in Hyrule Warriors come the questions. How would that work? What’s it going to look like? Am I going to have to clean up after it? Maybe nobody’s asking that last one, even if they should. All these questions would be easily answered if we can just see it in action. That was easy. 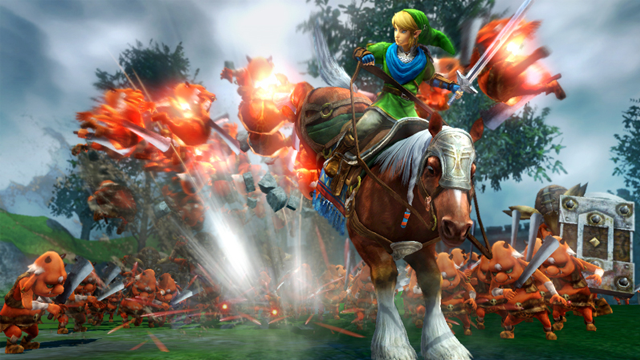 Epona, arguably the biggest weapon in Hyrule Warriors, is just like any other weapon. Link rides on Epona and attacks with his sword. Every so often, Epona gets to kick enemies in the face. It looks like it will enable Link to be very mobile allowing him to attack while he’s moving. Epona’s inclusion opens the doors for other characters to have weaponized mounts. Can a baby Dodongo weapon for Darunia be far behind? How about Agitha riding a giant mantis? Epona along with a couple of new costumes, a new map for Adventure mode, and a new scenario will be included in Hyrule Warrior’s upcoming Master’s Quest Pack DLC. It will be available for download on October 16th. No individual price was announced for this DLC, but the Season Pass of a sort for Hyrule Warriors is priced at $19.99, which includes three additional DLC pack. Karli Winata is an avid gamer with a taste for a little bit of everything. Except for sports games. And racing sims. And definitely not hidden object games! I guess everything is too broad a term. Suffice it to say that he has been known to play hours of Call of Duty multiplayer in between bouts of Persona fusing and Star Coin collecting while saving the world/galaxy through sensibly bald space marines or plucky teenagers with impossible hairstyles. Where does he find the time to write about them?